Although a popular technique, XOR drawing has some shortcomings. Rather than enumerating them here, I'll just point you to an article I wrote a few years ago for Reach magazine describing the problems with XOR, and the alternatives available with .NET and GDI+. Avalon doesn't currently support XOR drawing. In fact it really wouldn't make much sense. XOR drawing starts from the fundamental assumption that you are drawing pixels into a frame buffer. But in Avalon, you're a long way removed from the frame buffer. There's one there somewhere in the guts of the graphics card, but the primitives you get to work with are rather higher level. And with a composition-based user interface, XOR drawing is a whole lot less useful. For example, what would it mean to XOR something onto a Canvas which was partially occluded by some other visual element that was higher in the Z order, but which was partially transparent? It's possible to come up with a reasonable answer as to what should happen in such cases, but you completely lose the one benefit XOR offers: reversability. But this non-support of XOR is a Good Thing. It means that developers will have to use the superior alternative that Avalon offers! Note that this <Rectangle> element has initially been set to Visibility="Hidden". This is because when the application starts up, you typically don't want a drag rectangle to be shown. You can download a full example from here. (For those of you who find this via a web search a long time after I wrote it, bear in mind that this is designed to work with the PDC build of Longhorn, i.e. Build 4051.) When running, it should look like the picture to the right. It is not the simplest possible illustration of the technique. (Sorry! I got carried away.) It has a couple of extra features. First, there is a slider control that allows the opacity of the drag rectangle's fill to be set. In the picture here, it has been made partially transparent, as you can see. 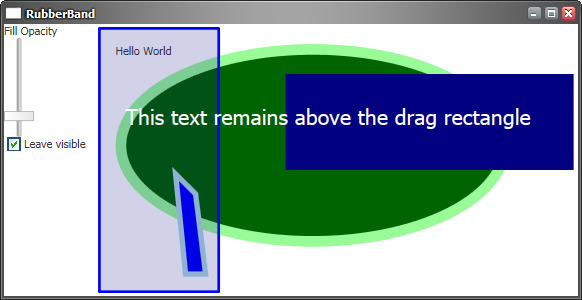 (The drag rectangle is the blue box the covers the text, the polygon, and part of the ellipse.) There's also a checkbox that lets you leave the rectangle visible after letting go of the mouse. (That was mainly to make getting a screenshot easier!) And finally, just to show that it can be done, one of the elements in the main window area is above the drag rectangle in the Z order. This means it will always be visible above the drag rectangle even if you choose to make it completely opaque. Note that this just shows the basic technique: using elements in the visual tree for overlays such as drag rectangles. Nothing happens when you let go of the mouse. (So if you are expecting to see the objects in the window be selected somehow, lower your expectations and then try again.) Also, this may not be how things will be done in the long term. The PDC build of Avalon has an intriguing class called AnnotationPanel which suggests that there might be specific support for adding overlays. However, this class is documented as "Not recomended for use at this time. Implementation in process." So I guess we have to wait until Beta 1 to find out how that's going to work.